A nationally recognized expert, Mark often serves as a source for the media on stories about family businesses and entrepreneurship. 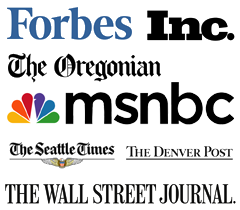 He has been quoted in a variety of well-known media including The Wall Street Journal, The New York Times, Fortune, Forbes, Inc., MSNBC, The Seattle Times, The Denver Post, The Oregonian, Business Journals and many others. Mark is a good resource for story ideas and has an extensive network of family business contacts. He understands working with the media and the realities of deadline pressure, and he is always willing to help with a story.